During the hot days of summer, it can be a joy to relax in a hammock. Take in the scenery, read a book, or take a nap. Sleeping in a hammock can actually help you fall asleep faster a give you better rest. Your sleep cycle can be disrupted due to back pains and aches and they can prevent you from getting to sleep at all. A strong supportive hammock that is properly hung is best for relaxation. In Central and South America, hammocks were invented for sleeping, then introduced to the Europeans. The British Royal Navy adopted them for use on ships, in the early 1600's. The movement of the ship provided comfort to the sailors and the hammocks held them securely while the ship tossed in the waves. You can fall asleep faster and get a deeper more fulfilling slumber on a hammock. 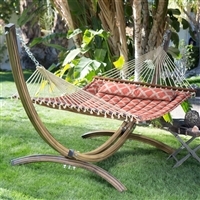 The rocking motion of the hammock promotes sound sleep. If you Haven't been getting a good nights sleep due to back pains and have access to a hammock take a few hours and give it a try. This may not work for everyone but it is an option.